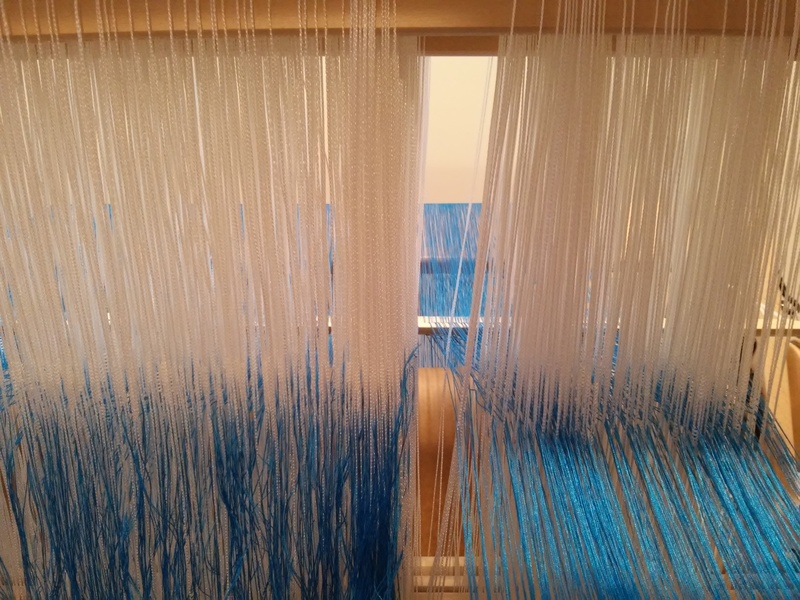 The Spring loom minus its front beam, showing the warping in progress. An overly ambitious weaving project is probably not the best idea for someone who has cancer, but I’m fearless (make that “foolish”). This project is shot silk yardage which I hope to tailor into a garment. (For lovely illustrations of shot silk, see my earlier blog). The weaving is 100% silk, 36 inches wide, three yards long, and is set at 50 threads per inch. 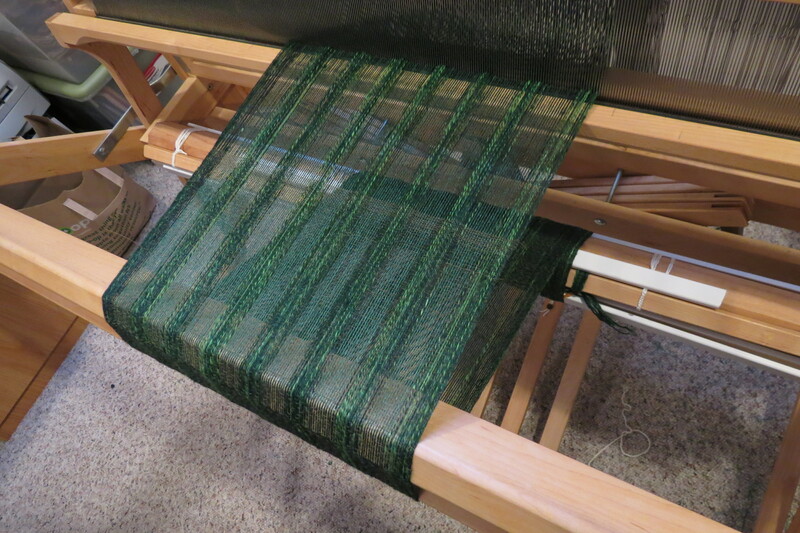 Four inches of warp successfully threaded (on right)…which means only another 32 inches remains to be done (on left). 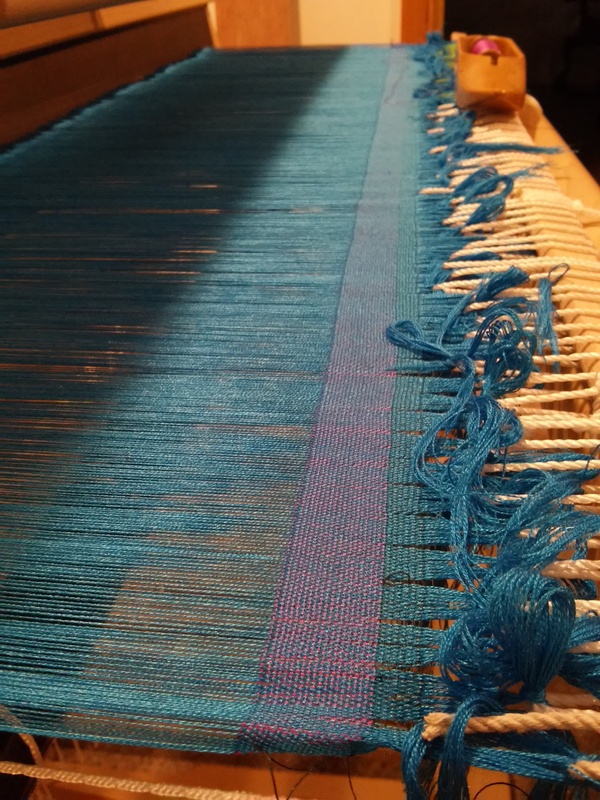 Putting the warp onto the loom was by far the most tedious part of the job. 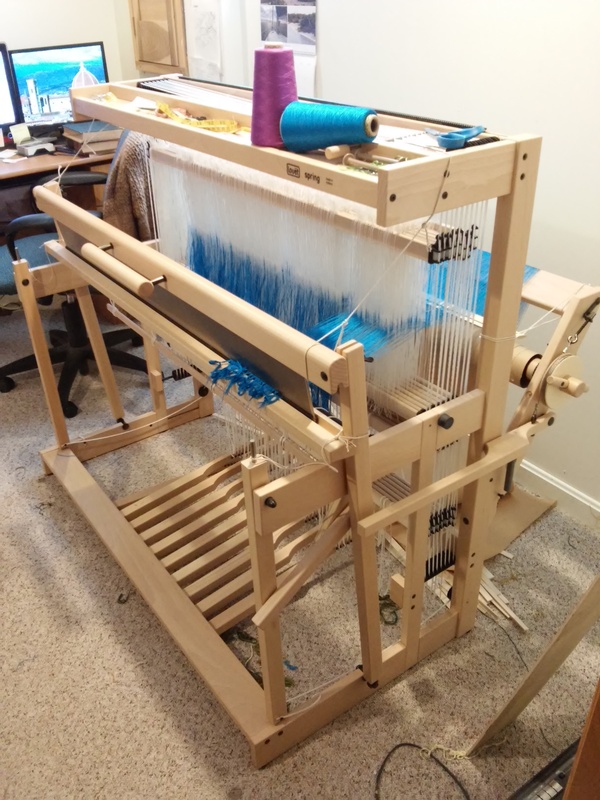 My Louet Spring loom has eight shafts, so I removed the beater and front beam and sat inside the frame, sticking fine threads through nylon heddles, over and over. Whenever I finished fifty threads, enough to want to get up and take a break, I’d take a look and realize that I’d accomplished only one measly inch, with apparently endless inches still to go. The task was unrewarding and so it languished, with only a few inches of progress made each week, before petering out completely. 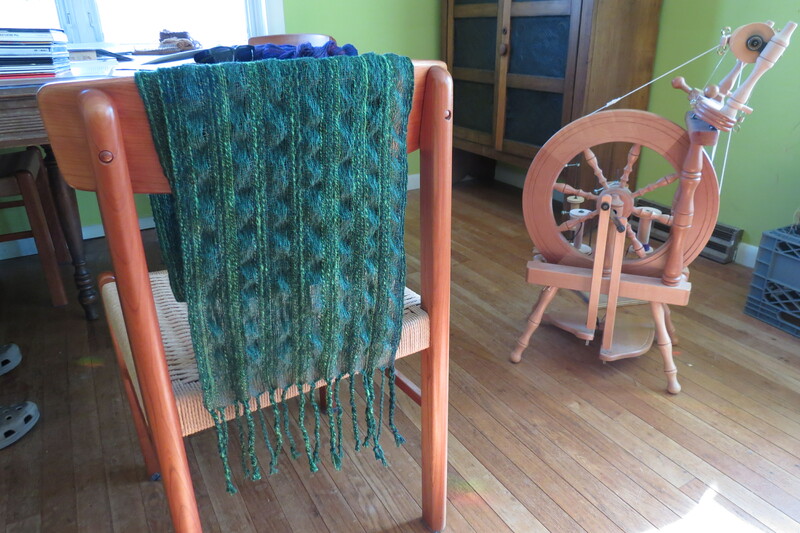 One day when my cancer symptoms seemed to be getting worse, I looked at the loom and thought “I really don’t want to die with this project left unfinished.” So I shamed myself into sitting down and finishing threading the warp, which took less than ten days when I worked with a will. The first inch was filled with beautiful iridescence. Shot silk is a plain weave that requires complementary colors, one for the warp and the other for the weft. 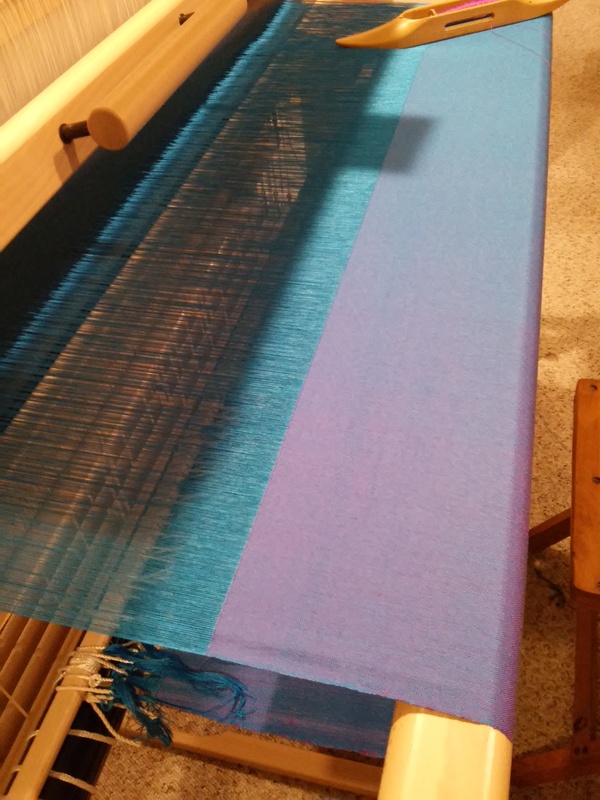 By the time I’d woven the first inch, I knew I had a winning combination: a rich periwinkle blue for the warp and a warm violet for the weft. The iridescence is outstanding: the violet highlights move with the viewer as one walks past the loom. Sighting along the iridescent silk cloth, the near surface is violet while the far end is mostly blue. Even though the weaving is straightforward, I have found that I need to pace myself. Because each inch of woven cloth averages around 30 passes of the shuttle, I have experienced a wrist problem caused by repetitive motion. I therefore limit myself to about half an hour of weaving each day, which results in about three inches or so of finished silk cloth. 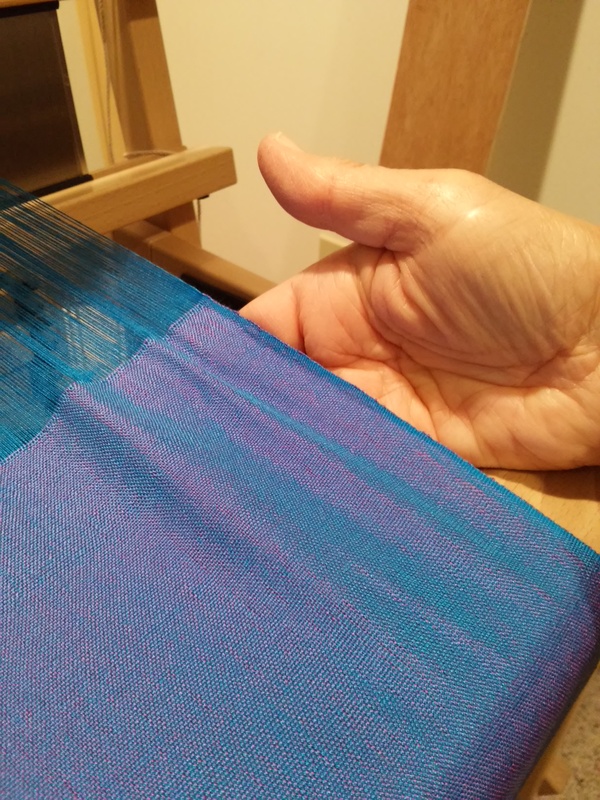 When the finished cloth is wrinkled, alternating blue and violet highlights shimmer across it. I originally intended to make a short-sleeved blouse out of the three yards of cloth that I will get from this project, but the highlights might better be suited to a skirt, or even a shawl. There won’t be enough yardage for a jacket, but there might be enough for a short kimono with three-quarter-length sleeves. Readers, what would YOU do with three yards of iridescent silk fabric? So beautiful!! I love iridescent fabrics. And the colors you’ve used are just gorgeous! I would make a shawl or small throw when the chill returns. I love this combination of what you’re doing. Silk is pure magic! This is so, so lovely. Its magical quality, I think, lends itself to something “flowy” like a shawl. I would handle it and drool and ask myself, “Did I really weave this?” I think cutting it for sewing would be too traumatic for me! But go for it if you want to! This is so beautiful, Carrol! Love the colors, and I look forward to whatever you create with it. All I can say is “wow”, Carrol. I have always loved shot cotton and silk–a memory that goes way back when I started to sew. 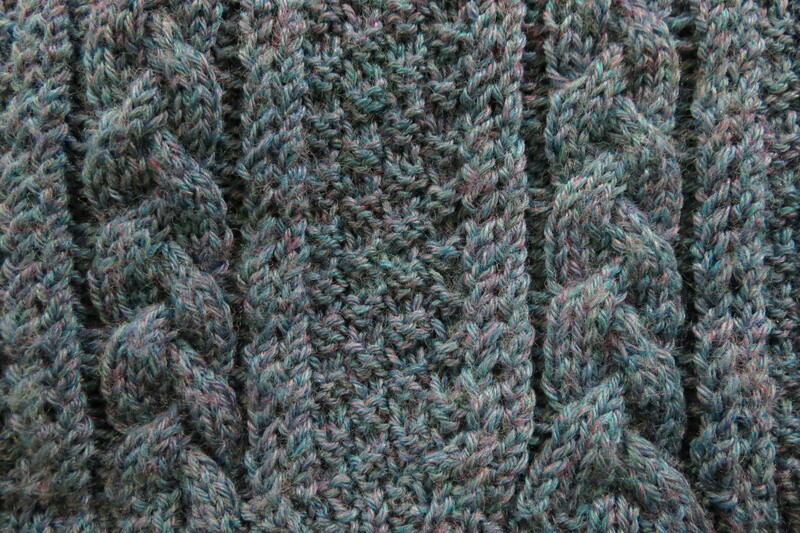 The iridescent quality is fiber alchemy to me. Such a wonderful success to accomplish a goal that you were determined to do. I agree with other commenters: I’d have hard time cutting into this fabric!